Travelling day; usual drill. Rouse the troops, get breakfast, try and stay awake and make sure you don’t forget anything important (like a piece of technology. Or a child). All went according to plan thanks to the Overminds’ preternatural organisational abilities and we arrived at Uluru with a minimum of fuss. The hotel was strange; trying to cater for tourists and their desire for luxuries with the local requirements of minimal impact on the land and resource usage. The room was big but spartan and you really got a sense of being out in the middle of nowhere. 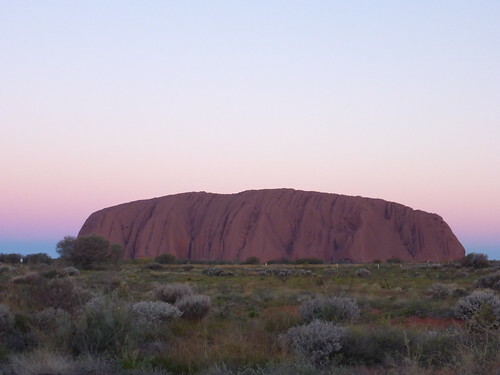 We were booked into a sunset tour to Uluru and we were scooped from the hotel by the tour bus. Uluru itself looked amazing as the colours and strata changed with the setting sun. It was very civilised, taking snaps, sipping wine and eating nibbles. The 500 million year old rock looked good too. Some nice Thai takeaway and early to bed.